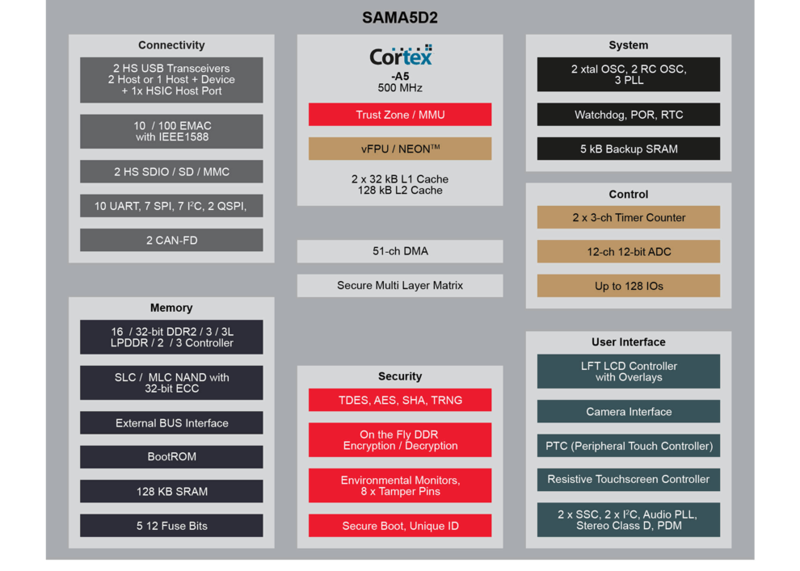 The SAMA5D2 series is a high-performance, ultra-low-power ARM Cortex-A5 processor based MPU. 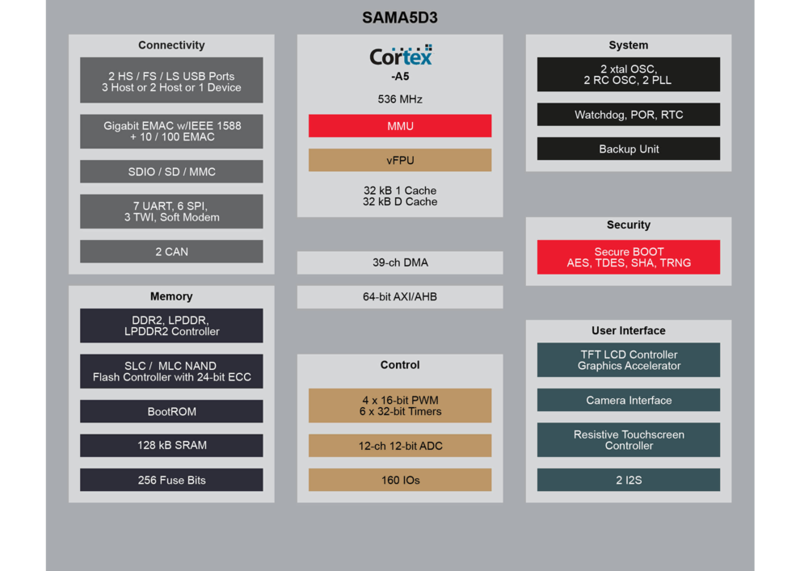 The Cortex A5 processor runs up to 500MHz and features the ARM NEON SIMD engine a 128kB L2 cache and a floating point unit. It supports multiple memories, including latest-generation technologies such as DDR3, LPDDR3, and QSPI Flash. It integrates powerful peripherals for connectivity (EMAC, USB, dual CAN, up to 10 UARTs, etc.) and user interface applications (TFT LCD controller, embedded capacitive touch controller, class D amplifier, audio PLL, CMOS sensor interface, etc.). The devices offer advanced security functions to protect customer code and secure external data transfers. These include ARM TrustZone, tamper detection, secure data storage, hardware encryption engines including private keys, on-the-fly decryption of code stored in external DDR or QSPI memory and a secure boot loader. 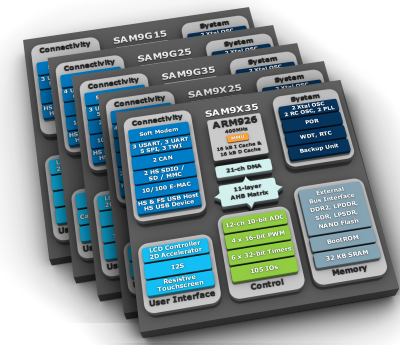 The SAMA5D4 MPU is ideal for any high-performance, secure, and cost-sensitive industrial application. High-speed computing needs are supported by ARM Neon and 128kB L2 cache which increases the overall system performance. The SAMA5D4 is an ideal fit for low-cost user interface applications that require video playback. The high-grade security features allows you to protect any system against counterfeiting and software theft, and allows you to securely store and transfer data. 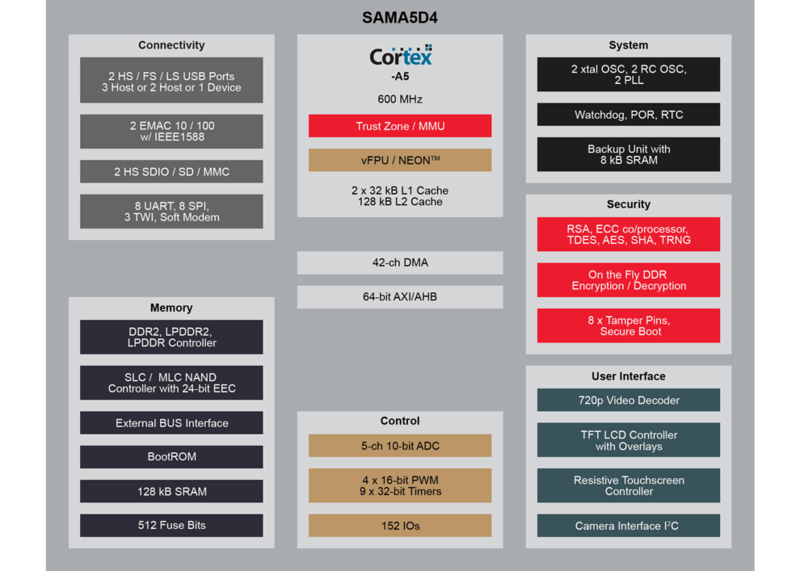 The SAM9x5 family is based on the ARM ARM926EJ-S core. The SAM9x5 family runs at 400 MHz and features connectivity peripherals, high data bandwidth architecture, and a small footprint package option, making it an optimized solution for industrial applications. Peripherals include a soft modem supporting exclusively the Conexant SmartDAA line driver, High Speed (480Mbps) USB Host/Device ports and Full Speed USB Host with on-chip transceivers, 10/100 Ethernet MAC, two HS SDCard/SDIO/MMC interfaces, USARTs, SPIs, I2S, multiple TWIs and 10-bit ADC. It offers support for 8-bank DDR2 and for LPDDR, SDRAM/LPSDRAM, static memories, as well as specific circuitry for MLC/SLC NAND Flash with integrated ECC up to 24 bits. The SAM9x5 family is available in a 217-ball BGA package with 0.8mm ball pitch, as well as a 247-ball BGA package with 0.5mm ball pitch.